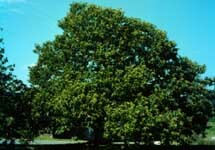 There are about five species of chestnut native to North America. It was, at one time, a prominent hardwood tree in the eastern United States. However, in the late 19th century, a fungus known as chestnut blight, introduced accidentally from Asia, destroyed most of the native stands. The wood of the chestnut had many commercial uses ranging from furniture to railway ties. Learn more about the different types of chestnut trees and the insects and diseases that affect them.